We start this episode in an underground mining city in Caithness, Scotland where miners seem to have stumbled upon an alien ship. One of them sees a wraith-like figure that eventually attacks one of them. Another dies in the confusion and becomes a ghost figure himself. Three days later the Tardis lands on the mining base, bringing the Doctor and Clara there instead of elsewhere. It’s not long before they both bump into the two ghosts who look at them and walk away. The ghosts lead them back to the ship, silently saying something but no one understanding what they are saying, when suddenly attack them. One of the ghosts is alien but looks human and dressed in Victorian style clothes. The ghosts cannot enter a certain room where the crew are protected from them. They only appear at night, not day. Even the Tardis is distressed by them and this concerns the Doctor. A rescue submarine responds to a Morse code distress call from the base but the Doctor warns them off in time as he has a plan to capture a ghost using the crew as bait. It seems to be working until they separate, two going after Clara, one going after another crew member who shows fear and it backs off, leaving him unharmed. The Doctor manages to capture all three ghosts in one room. They work out what they are trying to say; the Dark, the Sword, the Forsaken, the Temple, which seems to be a distress signal or coordinates. The remaining crew decide to find out what it all means instead of escape and search the sunken town for the Church/Temple where they find a container that is a pod holding something in suspended animation. The Tardis cannot translate markings on a wall in the ship but the Doctor thinks he understands why? It is then that the ghosts take control of the facility and flood the base, cutting off Clara and two crew, leaving them alone whilst he takes the other two back in time to find out what happened there. And then Clara sees something in the sea and realises it is another ghost. But not any ghost. Hurrah! Finally another new monster to give us all nightmares! A ghost with holes for eyes and murmurings with no sound in such a creepy way it sets the hair on the back of your neck on end! These truly are a new classic monster for the new era although something tells me these would be better suited to a Sapphire and Steel reboot which gave me nightmares as a kid. I still find it hard to walk to one of my local train stations for fear of seeing a dead WWI soldier with no face. This is up there with that episode! 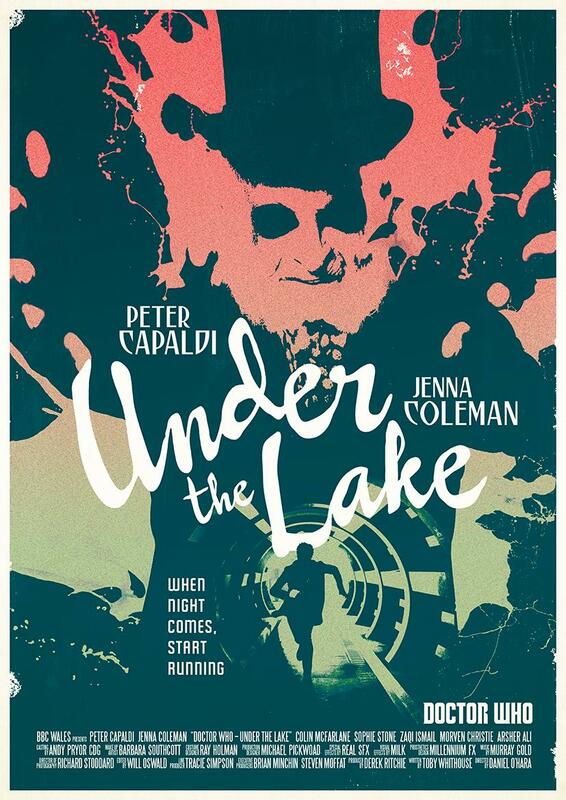 The whole inception of the story; from the under water mining facility, the drowned village to the ghosts themselves, was quite fantastic although looking at the second part I saw slight similarities to the fantastic French supernatural drama the Returned. This episode was a rush from start to finish and part two looks set to be just as good, if not better. It had so much going on in it that is was hard to keep up and required a second viewing just to catch missed bits. Kids would struggle though to understand what was going on as the story was quite complex even for some adults so an eight year old boy or girl would find it hard, yet I am sure the ghosts would give them enough to occupy their nightmares! And for once an episode that does not allude to the Doctor becoming a female regeneration which makes a change! All in all a good episode. If you are interested in the above poster or any of the brilliant work done by Stuart Manning you can buy his prints and he does commissions too. You can view his work here and buy them here.